Note to self: always bet on Apple. As a tech fan, there are plenty of times — particularly when you hear about billionaire investors and record-breaking stock prices — when you wonder whether you would have had the foresight to predict things turning out the way they have. Would you have bet big on Apple around the time of its 1980 IPO? Was it obvious that Steve Jobs was going to turn around the company in 1997? Or would you have been the equivalent of folks calling the Titanic an unsinkable ship, and pouring your life savings into pre-crash dot-com companies? 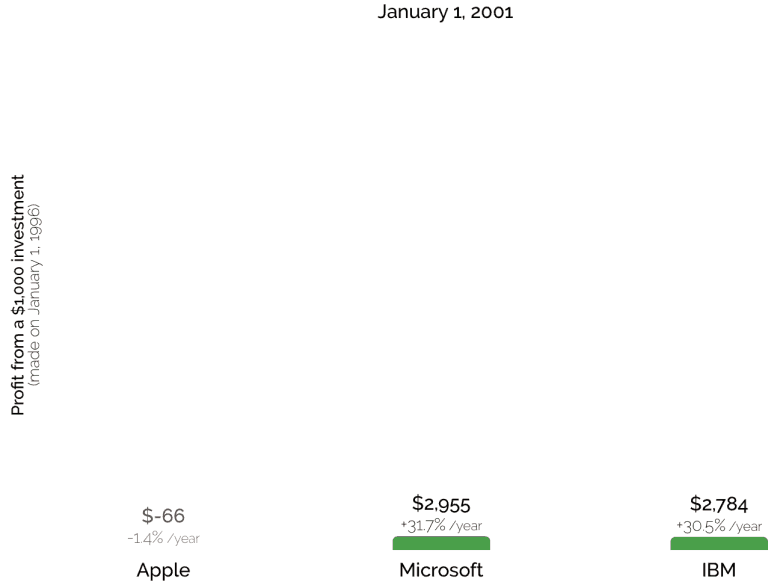 For the full effect, you should check out the animated version of this demonstration, which compresses two decades of fluctuating stock prices into just 60 seconds. If you’re just looking for the CliffsNotes version, however, I picked out five moments taken at five-year intervals, showing just how unpredictable the whole game is. And how Apple came to conquer the world. 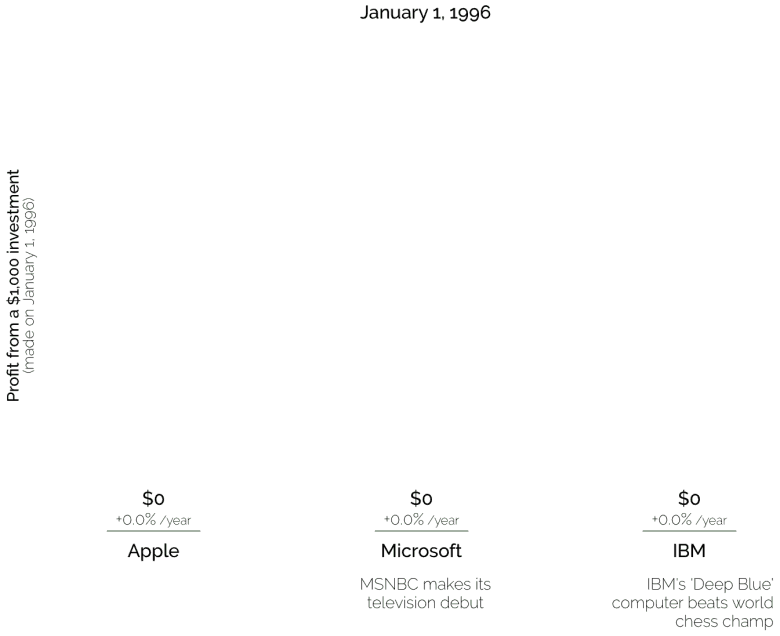 We start in early 1996, at a time when Steve Jobs had yet to return to Apple, Microsoft was running the show in a post-Windows 95 world, and IBM’s “Deep Blue” supercomputer had just beaten world chess champion Garry Kasparov in an artificial intelligence breakthrough. Five years later is the slice of data that surprised me the most. It’s a reminder that even the return of Jobs, the debut of the Bondi Blue iMac, and the iconic “Think Different” ad campaign didn’t immediately send AAPL stock rocketing upward faster than my Cult of Android colleague Killian hits his local bar on a Friday afternoon. Would you have sold after giving Jobs a fair chance to turn around Apple, only to lose money while your Microsoft and IBM investments brought home a tidy return? If so, you’d have made a terrible mistake — since Apple had a little thing called the iPod up its sleeve. What a difference five years makes, eh? 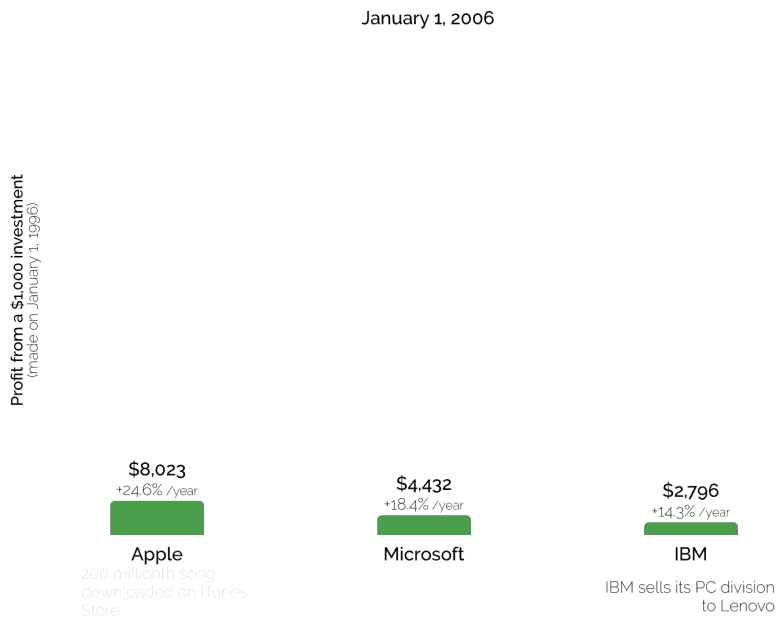 Buoyed by the iPod and iTunes, Apple (still known as “Apple Computer” until the following year) had overtaken both Microsoft and the sluggish IBM in profits from your original $1,000 investment. And the first iPhone hadn’t even been announced yet. 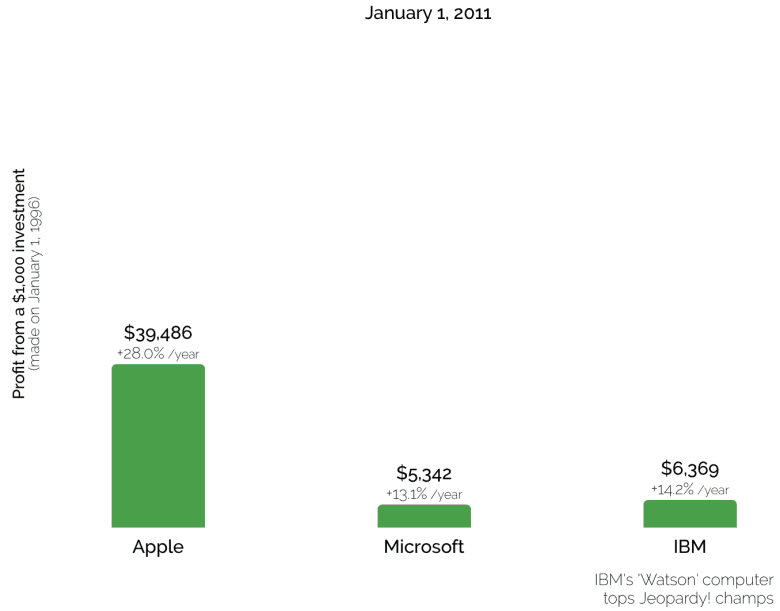 Another half-decade on, and Apple’s just completed its last year under Steve Jobs’ leadership. The iOS ecosystem is now in full effect, with the iPhone selling record numbers, while the iPad becomes the latest “must have” gadget for fans around the world. 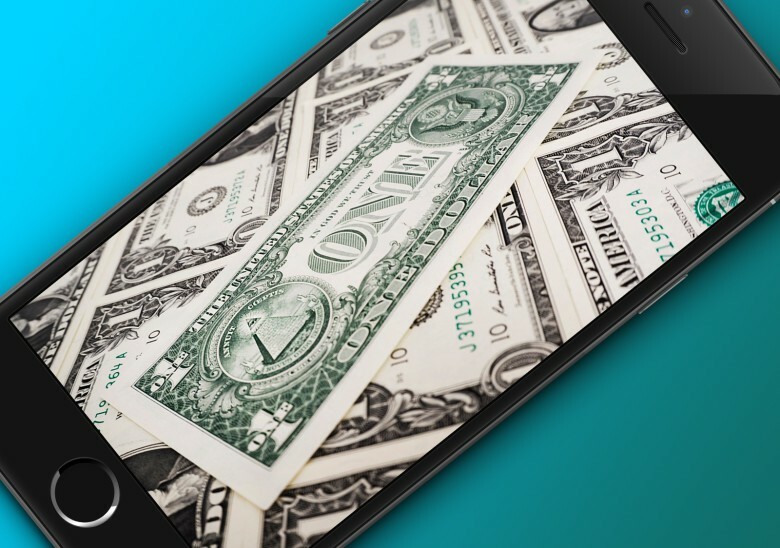 Your $1,000 has now netted you the best part of $40,000. 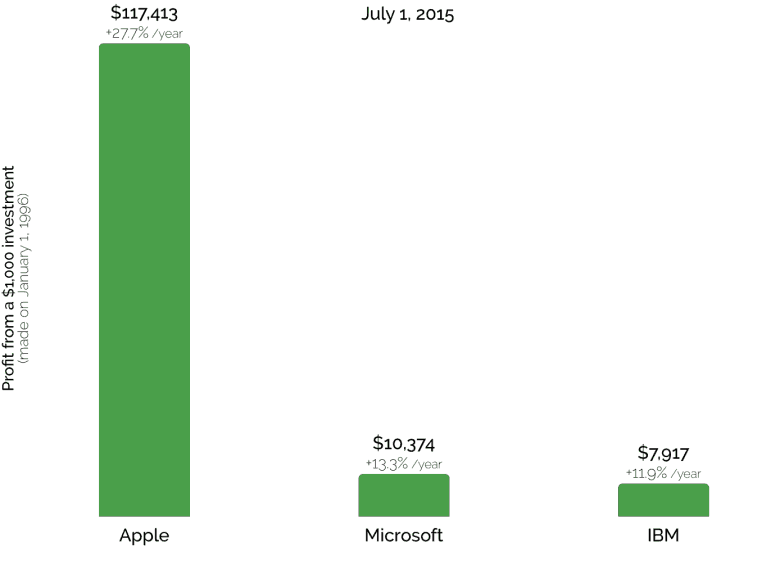 We’re basically in the present at this point, and Microsoft has rebounded slightly — while Apple has gone crazy with an enormous surge in its share prices, driven by the mega-success of the iPhone. Would you have dropped your Apple stock years earlier when Steve Jobs died? If so, you’d have missed out on this gigantic boom period.